Events added to EnjoyHolistic are viewed by thousands of people looking for holistic or spiritual events near them, your events are syndicated to our successful events mobile app. Add content about your services or events you're hosting. Members can join your group page allowing you to stay in touch with them and engage with your audience. Add content about your services. 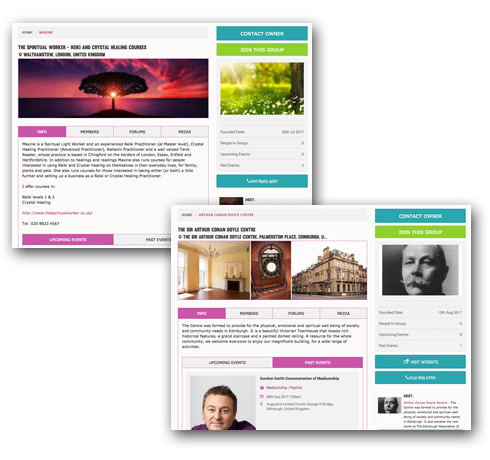 If you add events to EnjoyHolistic.com you can attach them to your listing so people can see what events you're hosting at a glance. Attach events to your listings. Add a contact details, website, phone number, contact box. Add your location and map. Payment taken in USD, EUR or GBP. Please note: You may add yourself for free for kindly assisting us to grow this beautiful community. Simply apply the following coupon code when adding a practitioner listing. Offer ends 1st September 18.